Whether it's for your sports team or campus club, organizing and financing a team gear package almost always results in a headache. Organizing a bulk order and..
...are some of the headaches we hear about from coaches and boosters. Using online stores to enable player and parent ordering ELIMINATES HEADACHES! The most progressive Team Dealers are using eCommerce solutions to help team merchandise the team gear and player packs that they want the players to have for training, practice and sideline gear. Choosing apparel, managing order forms, and collecting money for payment are three of the top problems we hear from coaches who have struggled with team apparel in the past. Let's talk about 3 ways that an on line team ordering solution can help coaches solve some of the main problems they face when buying team gear packages. Choosing merchandise is the first major step towards creating a team package. Vendors like Under Armour, Adidas and Champion put a wide array of products into their catalogs, which can be time consuming to sift through. From the time it takes to receive a catalog, review the material, and then decide what items to choose, relying on catalogs can significantly increase the time line for a team buy. While catalogs offer a variety of choices to choose from, marketing specialists from every brand don't always make it easy for you to choose the best product for your team. A Team Dealer with a Merchandising Team should already be familiar with the different catalogs or brands that interest you, and can use their product knowledge to help you narrow down the search and choose merchandise that's professional and affordable. Once they help you decide which gear suits your team, a dealer can set up an on line store front for you that includes the different items you've chosen, with the customization you want for your team. Now that we've talked about choosing product, let's talk about the ways that an on line team gear solution can simplify the ordering process. Traditionally, coaches have to pass out order forms, hope that the forms are filled out in time, and then collect them from parents or athletes. Rushing to collect individual forms is not only time consuming, but can be risky if you have an absolute deadline to stick to for ordering team gear. Not to mention that misplacing an order form for one or two athletes may break morale and make them feel excluded from the team. By utilizing the resources of your team dealer, you can eliminate the hassle of organizing a team purchase through an on line store front. Your team dealer should already have helped you to choose the right products for your athletes, and discussed ways to customize the gear on your personal shopping page. Once the store is open, athletes-- or their parents-- can log onto the store front, order the type of items they want in the correct sizes, and with your team logo. How simple is that? Not only will you save a few trees along the way, but you can save yourself the time it takes to properly manage individual forms for your team order. Collecting order forms is tough enough, but collecting payment for a team gear package is an even greater struggle. Whether your athletes forget to ask mom for a check or fund raising efforts don't generate enough profit, finding money to outfit your team can be a challenge in and of itself. To make matters more frustrating, coaches oftentimes end up paying for their team packages out of pocket, and are stuck chasing down parents for re-payment long after the product has been received. A team ordering solution eliminates this inconvenience once and for all. 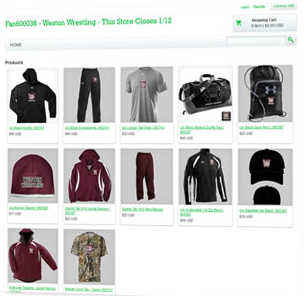 With access to a team store front, not only do your athletes choose the items that you've customized and they want, but they'll pay for it on their own through the on line store and have the order shipped straight to home. It's that simple. If you've handled team purchasing in the past, you know that it can be burdensome and take away from other things-- like practice time-- that you don't want to sacrifice. If you want to focus more on your time behind the whistle than you do organizing a team purchase, then an on line team store may be the right choice for your team. Are you looking for ways to simplify your approach to purchasing team gear packages with online stores? This page describes the benefits. Click here to learn about using online stores for enabling player and parent gear ordering. At SquadLocker, we're the experts when it comes to products, packages and team stores for our customers. Call, chat or email us if you'd like to save time and money with a team ordering solution today.